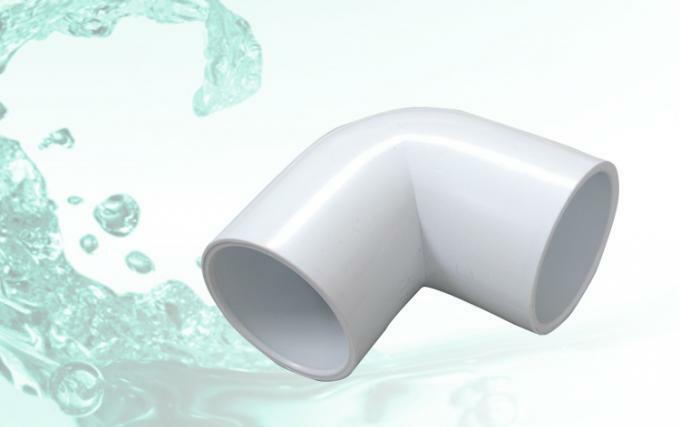 The 90-degree elbow pipe fitting is made of PVC and easy to be connected. 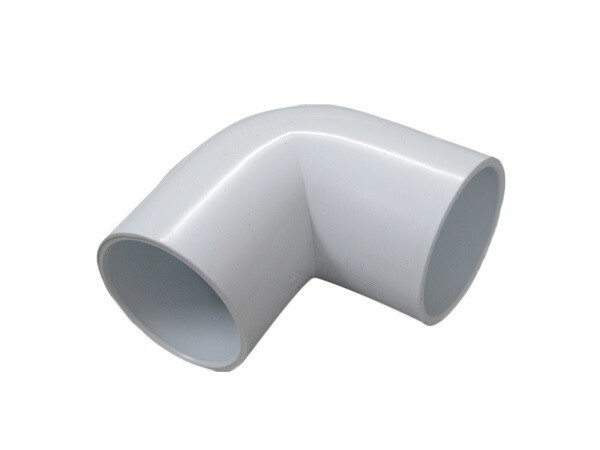 This 90-degree elbow fitting, or "ell," connects two pipes at a 90-degree angle to change the direction of flow between pipes. It has female slip openings for sliding over the ends of male unthreaded pipes. The slip ends connect to pipes with a smooth bore for enhanced flow. This schedule 40 (standard wall) fitting is made of PVC for corrosion resistance, high strength, and less weight than fittings made from metal. It is compatible with schedule 40 PVC pipes and fittings and is suitable for cold-water(or hot water) pressure distribution systems including irrigation, pool and spa, potable water, and chilled water applications. PVC can be connected to other materials such as steel, copper, or cast iron using transition fittings. This fitting provides superior flow to metal because of its smooth interior finish, which reduces friction and inhibits buildup of materials. This fitting meets American Society for Testing and Materials (ASTM) D2466 and D1784 specifications for quality assurance. Pipe fittings are components used for connecting, terminating, controlling flow, and changing the direction of piping in many different industries. Fittings are available in many shapes, styles, sizes, and schedules (pipe wall thickness). OEM ( Original Equipment Manufacture ) and ODM ( Original Design Manufacturer ) projects are welcomed!